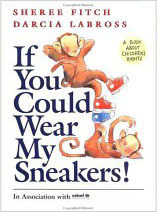 This book was a result of being asked by UNICEF to write a book that could be used as a point of departure for adults and children to discuss rights and responsibilites. The book was an enormous success and flew off the shelves but ever as Doubleday stopped doing Children's picture books it has been difficult to get. I am grateful for all of you who have requested and used this to promote peaceful environments in your classroom. I will continue to see if I can find a publisher who will reprint. "This collection of humorous poems interprets 15 of the 54 articles of the United Nations Convention on the Rights of the Child. The nonsense verses use the antics of a variety of animals to present the idea that all children have the right to an education; adequate food, shelter, and health care; safety; privacy; fair treatment; protection from war; and freedom of speech. Playful cartoons on single- and double-page spreads capture the whimsy of the poems. The underlying seriousness of the subject is not undermined by this lighthearted treatment; rather, the approach invites children to enjoy the fun and then think about the meaning. A section at the end matches each selection with the article it represents. Intended to raise awareness about the rights of all children throughout the world, this book would be particularly effective in classroom discussions about rights and responsibilities." Winner of the Silver Birch Award and Atlantic Hackmatack Award, shortlisted for others. Click here for children's activities. Check out this artist's self designed awesome webpage. And look what happen when a peace poem travels.